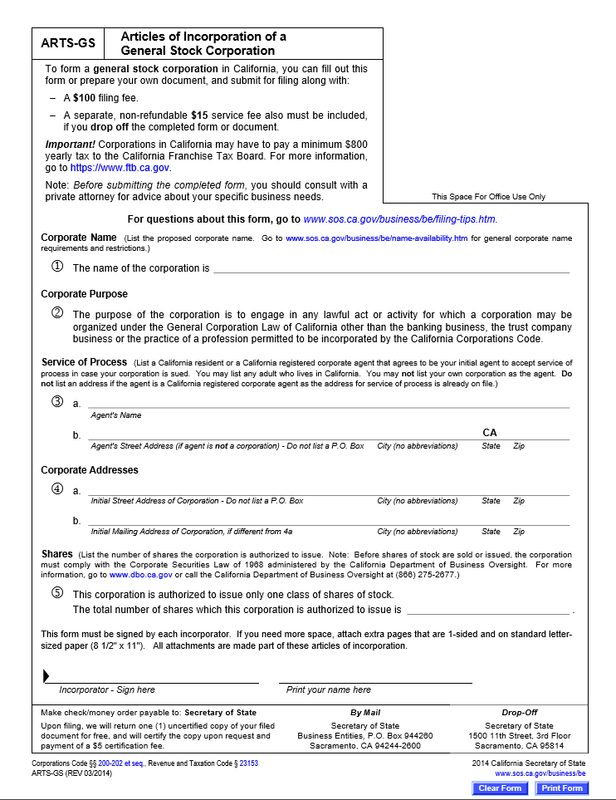 The California Articles of Incorporation of a General Stock Corporation | Form ARTS-GS must be filed with the California Secretary of State whenever an entity wishes to conduct business as a for-profit general stock corporation. This form may only be filed by mail or by drop-off. The original, any required documentation (i.e. additional provisions), and payment for a filing fee of $100.00 (if physically dropping this off, an additional $15.00 service fee will be charged as well). When filing this form, you will receive an uncertified copy of the filed document (free of charge). You may have this certified for a fee of $5.00 upon request. 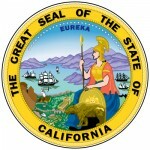 You may file these articles by mail by sending it to Secretary of State Business Entities, P.O. Box 944260 Sacramento, CA 94244-2600 or you ay drop them off at Secretary of State 1500 11th Street, 3rd Floor Sacramento, CA 95814. You will also need to submit a Statement of Information (Form SI-200), accompanied with a $25.00 filing fee, which may be done by mail, in person, or electronically within 90 days of filing the articles. You may find more information here: http://www.sos.ca.gov/business-programs/business-entities/statements. Step 1 - In Item 1, “Corporate Name,” enter the name of the corporation being formed on the space provided. Step 2 - The “Corporate Purpose” is defined in Item 2. Step 3 - In Item 3, “Service of Process,” report the full Name of the registered agent the corporation being formed has appointed to accept the service of process when that corporation is being sued. This must be an individual who is of adult age or a corporation other than the one being formed that maintains an address in the state of California. On the next line, report the full Address of this party unless it is a previously registered corporate agent (as this will be on file). Step 4 - In Item 4, “Corporate Addresses,” list the Street Address of the corporation being formed on the first line (Post Office Boxes are not Acceptable). If the Mailing Address of the Corporation differs from the Street Address, it must be documented on line 4b. Step 5 - In Item 5, “Shares,” report the total number of authorized Shares may issue on the blank space provided. Step 6 - Next, each Incorporator must sign and print his or her name. There is enough room at the bottom of this document for one Incorporator to provide this. 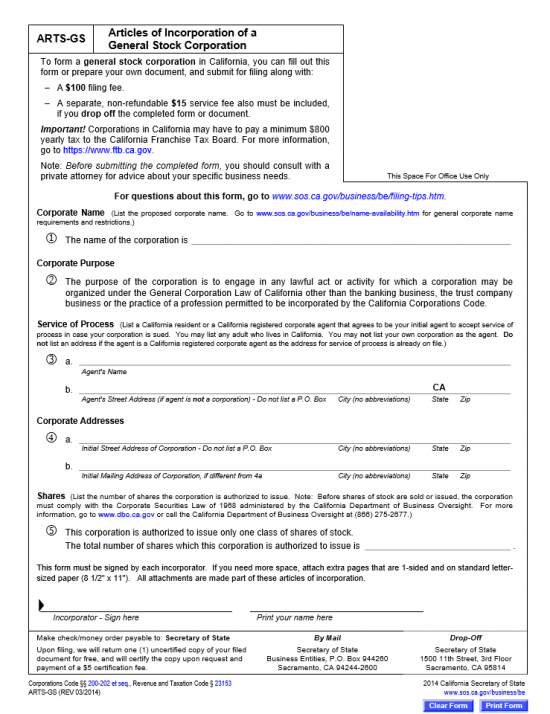 If there are more, have the additional Incorporators sign and print his/her name on an 8 1/2″ x 11″ sheet of paper then attach this to the articles being submitted.